About 4 years ago, I wrote a lengthy blog post about my experience shooting on safari with the Fujifilm X-T1. In that post, I shared some of the challenges I had and the changes that I wanted Fujifilm to make to improve the experience and results. I had an interest in this: my complete Canon kit for safari shooting weighed about 30 pounds by the time I included all the lenses and bodies. The same kit with Fuji gear weighed about 10 pounds and packed smaller! Since that post, I’ve continued bringing Fujifilm gear on safari and now it’s the only gear I bring. This last October, I brought the just-released X-T3 along with an X-H1. I even have an X-E2 that I had converted for infrared photography. 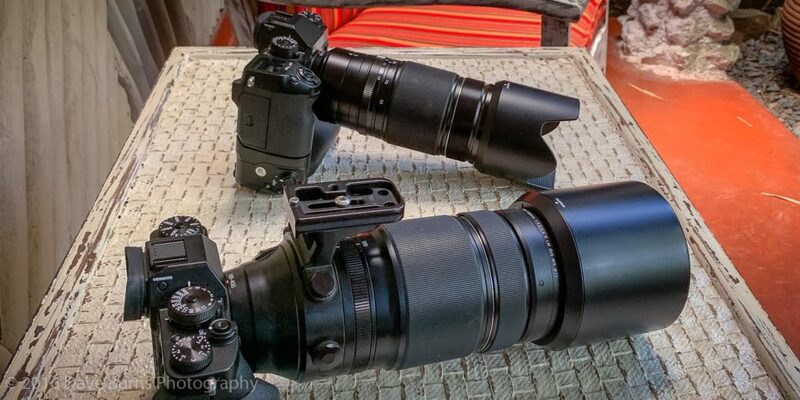 My lenses were all Fujifilm as well: the 100-400mm, the 50-140mm, and the 18-55mm. For infrared, I also brought the 14mm and the 35/1.4 since those work well for infrared and are compact. After our final morning at our Serengeti camp, we hit the road and reached our lodge in Tarangire National Park by nightfall. I always enjoy Tarangire because it has the highest concentration of elephants and baobabs on the northern circuit and those are some of my favorite subjects. It’s chock full of plenty of other wildlife too; I’ve had my best leopard sightings here, lions in trees, large families of giraffe, antelope, and birds. And this time, there were more zebra than I’m used to seeing – we saw plenty of large herds. I just sold a framed print of Baobab Tree at Sunset: 12 x 18 inches plus matte and frame. When someone buys a print, I always enjoy telling them the story behind the photo. This image was taken on one of my photo tours that I lead in Tanzania and was made with my DSLR modified to record infrared light. The Fuji X-T1 on African Safari – How Well Did It Work? UPDATE 12/15/2014: I’ve caught some grief in online discussion groups for the images in this post and it made me realize I should have been more clear about my intentions. You can find articles everywhere online that show off the best a camera can do. The images here are not those. My goal was to illustrate challenges the X-T1 has and where Fuji needs to improve the X Series features if they want to better serve certain markets (sports, wildlife, etc.). The other goal I had for this post was provide an answer to the question I’ve received more than once from my clients: should they bring their mirrorless camera on one of my safaris? Until now, I’ve had to say, “I don’t know.” With this experience, I can give them a more balanced answer. In a recent post, I described the kit I took on the most recent photo tour I led to Africa. The kit included the Fuji X-T1 and in this post, I’m going to talk about my impressions of using that X-T1 in the field, how well it performed, and whether I would bring it again. At the end is a gallery of images I made with the X-T1.